I’ve never really thought about this before, but a shopping cart handle has to be one of the primary spots for germs to fester. I mean, people come in with colds, wipe their noses with their bare hands, and wheel their carts around the store. Some people might have their kids sitting near the handle, and these little tykes might sneeze on the handle for some extra germ action. It appears that PureCart has found a solution to all those that have Monk-like tendencies when it comes to germs on their shopping cart handle. 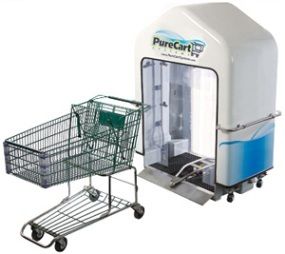 Instead of carrying wipes or surgeon’s gloves, all a customer needs to do is use a cart that has been pushed through the PureCart System. The PushCart System is designed to spray a sanitizing solution onto the entire cart, and this quick-drying solution takes care of the rest. By the time a new customer uses the cart, it is squeaky clean and germ-free. Of course, what about the baskets or the child seat? There is an option of using a spraying wand filed with the same sanitizing solution to clean them. Unfortunately, there doesn’t seem to be any easy pushing system for dealing with them. The Pushcart System only costs about one to two cents per cart once fully installed. I’m not certain what type of maintenance is needed, or how much that costs.